'BARN ROOF SUMMER HAZE' BY CHARLES SWISHER. 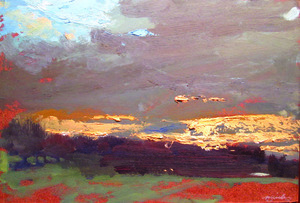 “Inspired Landscapes,” which opened last weekend, brings new artists – and top-quality work – to the Oxford Arts Alliance. The 13 artists have created landscapes that go well beyond what you might expect. 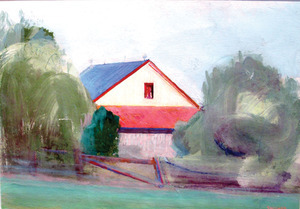 The thin, airy quality of the gouache in Charles Swisher's barn views – “Barn Roof Summer Haze” and “Barn Through Brush” – perfectly evokes the hazy heat of a summer day. William Kocher's “Anchor” is a stormy sweep of black clouds, and the mood it creates is dramatic. Kocher's “Moon Over Field” is also splendidly evocative. Dorothy Frey goes big in “Gray in the Dark,” a nighttime view of a barn and magnificent tree that makes great use of blue to express the dim light on gray buildings. John David Wissler has three loosely painted oils that achieve a marvelous sense of atmosphere – particularly “Ancestor's Rest,” which catches the glow of sunset clouds and the high, blue patch of sky above them. E.M. Saniga's “Double House Near Oxford” is elegantly rendered, and his “View of Bentlyville” encompasses acres of farm fields, trees and distant buildings. 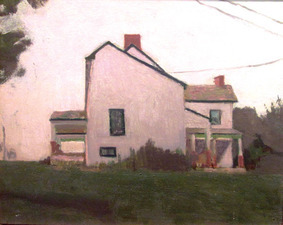 Kurt Knoblesdorf's thickly painted work succeeds best in “241 North Prince, Lancaster,” which captures a backlit house front with admirable skill. Ruth Bernard's paintings of rural roads leap with color and life, and Jay Noble has three fun little vignettes of backyard details. There's a catalogue available with one painting by each artist, making it a nice keepsake of an ambitious exhibit that raises the bar for regional art. “Inspired Landscapes” continues through Oct. 31 at the Oxford Arts Alliance (38 S. Third St., Oxford). For information, visit www.OxfordArt.org.